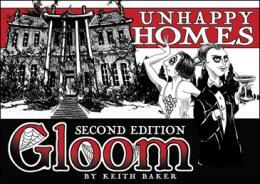 The Unhappy Homes expansion for Gloom expands the game with Residences and Mysteries. 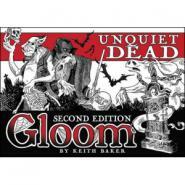 These new cards give your wretched relatives a place to hang their hat, if they can survive the bumps in the night. It also includes a new family, les artistes of Le Canard Noir, whose creative endeavors always end in disaster. 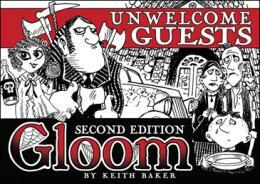 Unwelcome Guests is named for its horrible houseguests, a collection of undesirable characters who move from family to family during the game, with ruinous results. But that is not all: new persistent effect icons allow some cards special effects to continue to be active even if covered by another card.